What is a Common Noun? Labels for General Things. Our common speech is all about labeling things as well as expressing our thoughts. Before we even developed an understanding of language, we have been labeling things particularly things that we need. This is why babies’ first words are often common nouns like mom, dad, milk, food, ball, etc. Before we even learned about grammar, we have been saying a lot of common nouns. Common nouns are used to name general persons, animals, places, things or ideas. 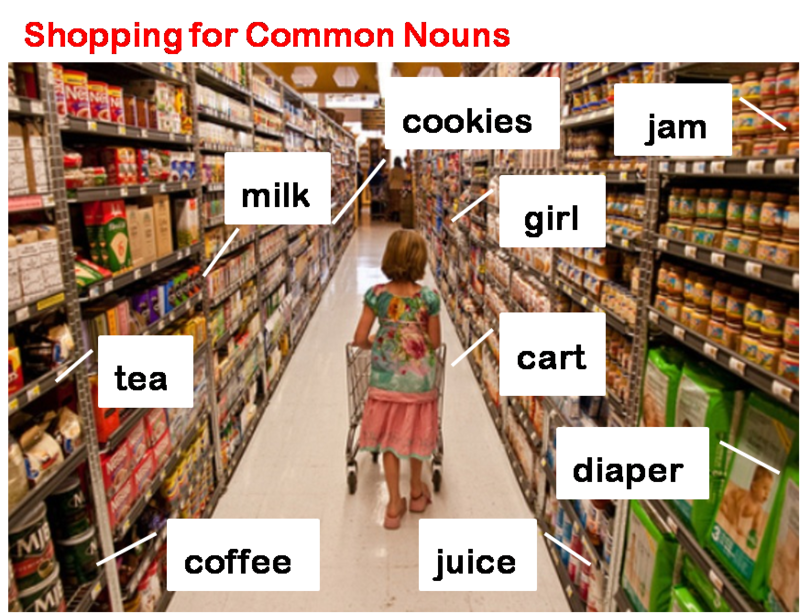 The opposite of common nouns are Proper Nouns, which are used for labeling specific things. In truth, proper and common nouns have a very close relationship. For every proper noun, there is a common noun. However, not all common nouns have proper noun counterparts. 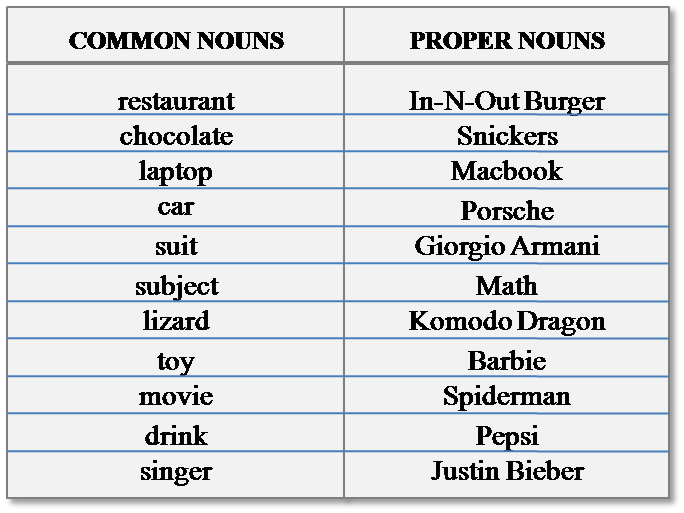 Study the chart below to have a better understanding of common nouns and their relationship with proper nouns. The first letters of common nouns are not capitalized like proper nouns unless you begin a sentence with a common noun. 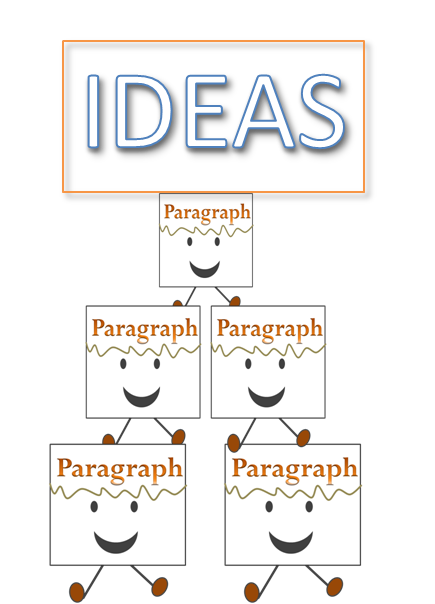 Moreover, common nouns are often introduced with the articles the, a or an in sentences like “the children”, “an ant” or “a toy”. 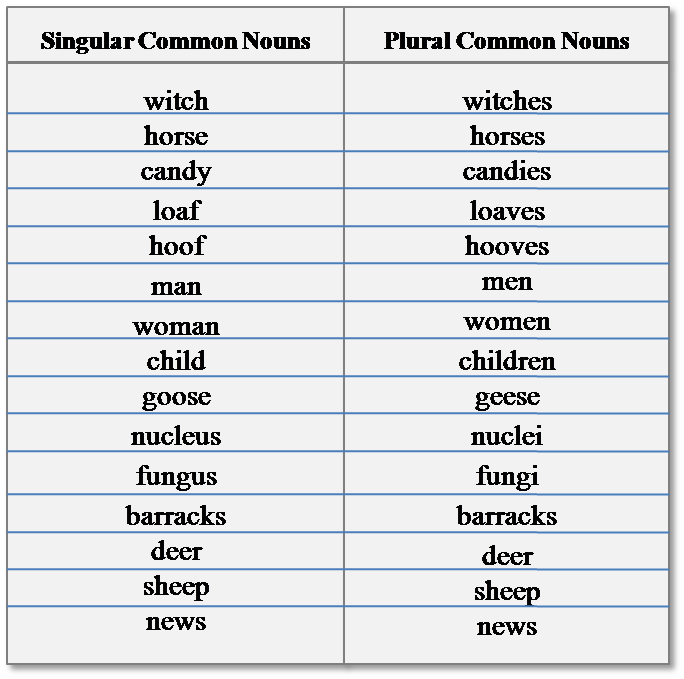 Common nouns can either be plural or singular nouns. The general rule is to add an –s or –es on the singular common nouns to make them plural. However, there are some exceptions as can be seen in the chart below. There are also a few common nouns that do not change and only an article such as “a” or “an” will denote if it is singular or plural. 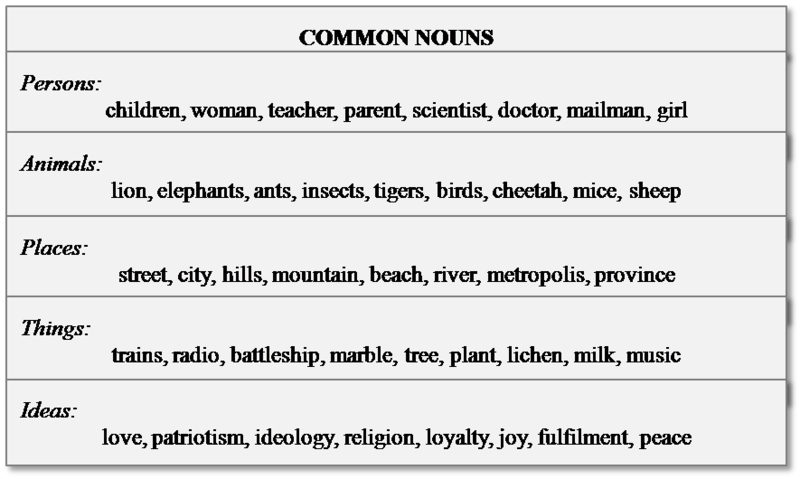 Common nouns can be grouped as count nouns. Count nouns are the labels we give for things we can count. On the other hand, common nouns can also be mass nouns. Mass common nouns are the labels we give for things that we cannot count or things we consider as a whole. Common nouns can also be classified as concrete nouns and abstract nouns. Concrete nouns are those that we can perceive using our senses, namely, sight, hearing, taste or smell. Meanwhile, abstract nouns pertain to ideas, qualities or feelings. What is a Common Noun Usage? 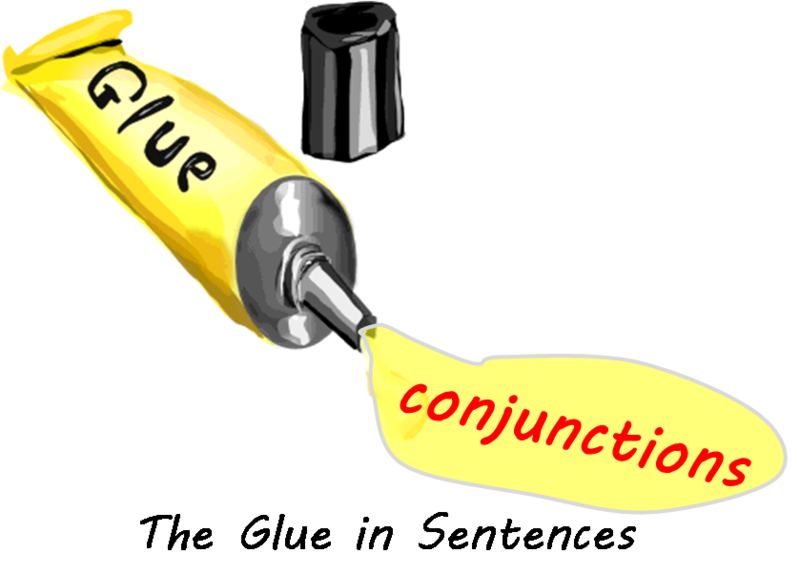 A common noun can perform various jobs like a subject, direct object, indirect object, object of the preposition or a predicate noun. 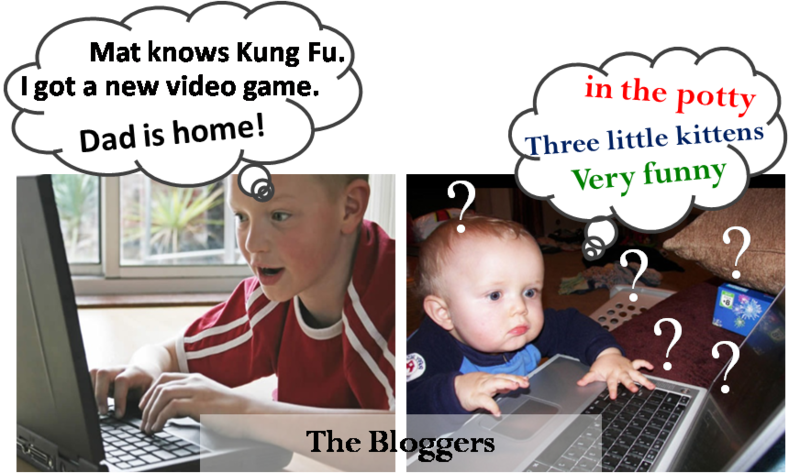 A subject is the word being talked about or performing an action. Common nouns have often been used as subjects in sentences. Common nouns can also be direct objects. A direct object receives the action of a transitive verb. 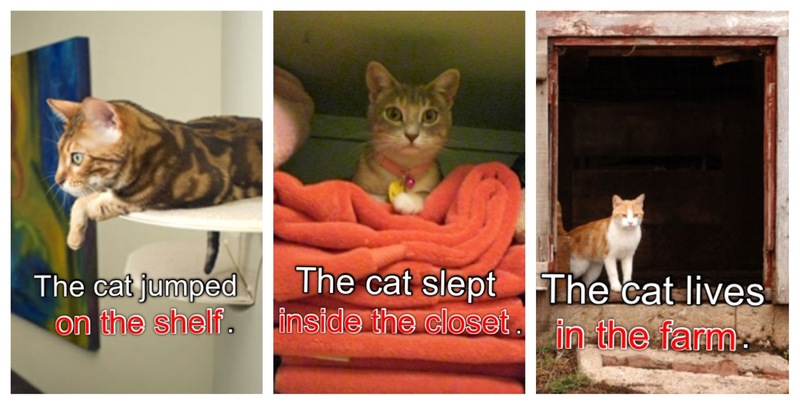 Moreover, we often use prepositions like in, of, at, between, etc. In order for prepositions to make sense, they need an object. In this case, a common noun can be used as the object of the preposition. If common nouns can be subjects, they can also be part of the predicate. The predicate is the part of the sentence describing the subject. Here is an example of a predicate common noun. As you can see, learning “What is a Common Noun?” has been a worthwhile adventure. It is re-learning what you have previously known and more. After all, you have been using common nouns every day of your life, whether verbally or in written form. Common nouns are as common as they come, but for sure, they comprise an important part of our speech.